Ruth Ellen (Eckard) Bollinger, age 90, died October 8, 2018 at Page Rehabilitation and Health Care Center in Fort Myers, FL. She was born on September 25, 1928, in Silver Run, Maryland, the youngest of three children born to Madeline and Clarence Hoover. Her mother died when Ruth was just five months old. Ruth was adopted by Rachel and Luther Eckard of Westminster, MD. She graduated from Westminster High School in 1945 and started her career in banking that year. Ruth married Richard Bollinger on April 3, 1948. She was employed by Carroll County Bank and Trust Company for 48 years, beginning as a bookkeeper and advancing through the years to become a Vice President of Human Resources, the title she held when she retired in 1993. She was an active member of Grace Lutheran Church in Westminster where she served on the Church Council, taught Sunday School, and was an organizer of the Luther League in 1946 for Carroll County. 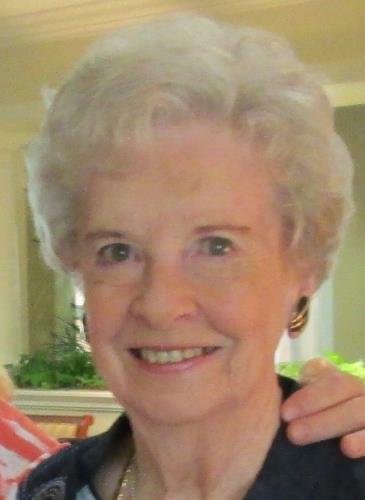 She was a charter member of the Carroll County Community Chorus, a charter member of the Carroll County Toastmasters Club, and a life member of the American Institute of Banking. She was a member of the Westminster Ladies of the Elks as well as a volunteer at Carroll County General Hospital. She served as the organist at St. Benjamin's Lutheran Church for ten years. Ruth and Richard moved to Fort Myers, FL in 1997 and joined Zion Lutheran Church where Ruth sang in the church choir and served as a lay reader. She also volunteered at the Southwest Regional Hospital. She enjoyed gardening, playing the piano and organ, and entertaining friends and family. She especially loved dogs and was well-known in the neighborhood for providing treats to all the dogs that stopped at her house. She is survived by her daughter, Susan R. (Barrett) Genson of Fort Myers, FL and Grafton, WI; three grandsons, Scott (Anna) Oakes of Brookfield, WI; Stephen Oakes of Grafton, WI; and Ryan (Staci) Oakes of Cedarburg, WI; five great-grandchildren; sister, Frances Duttera of Littlestown, PA; brothers-in-law, Robert Bollinger of Taneytown, MD; Lester Bollinger (Dorothy) of Union Bridge, MD; Maurice Bollinger (Betty) of Hanover, PA; sisters-in-law, Evelyn (Harry) Newlin of Thurmont, MD; and Doris (Kenneth) Crouse of Taneytown, MD. She is further survived by many nieces and nephews. She was predeceased by her husband of 67 years in 2015. A memorial service will be held Friday, October 26 at 11 am at Grace Lutheran Church, 21 Carroll St, Westminster, MD. Private interment will take place at Trinity Lutheran Church Cemetery, Taneytown, MD. God bless all the angels who took care of Ruth in her final years at Brookdale (both in Assisted Living and in Memory Care) and at Page Rehabilitation and Health Care Center in Fort Myers, FL. In lieu of flowers, donations are appreciated at any "no-kill" animal shelter in memory of Ruth. Funeral arrangements have been entrusted to Hodges Funeral Home at Lee Memorial Park of Ft Myers, FL and Myers-Durboraw Funeral Home of Taneytown, MD. For information call 410-756-6688.